Collaborative community artwork has the power to reflect both current and historical concerns and inspire change. How does Muniz collaborative artwork connect with First Nations communities in British Columbia and throughout Canada? How does Muniz’s collaborative artwork reflect a community’s current and historical concerns? What actions might collaborative, community inspired artwork inspire in others? BIG IDEAS Anywhere educators: View the Untitled (Wolf) by Muniz Guided Tour Video MUTE ON and encourage students to explore at different angles individually and in groups. • Use the Art Inquiry Worksheet (PDF) to guide and capture their ideas and impressions. Customize or create your own Art Inquiry Worksheet as appropriate for your project and class needs. • View Guided Tour Video: View the Untitled (Wolf) by Muniz Guided Tour Video again with SOUND ON. • Significant Aspects of the Artist’s Life & Work: Using the About the Artist and Artwork (PDF) and the further resources listed below students/teachers can create stations detailing Muniz’s life and work. In small groups, students rotate through these stations. Topics might include: (1) education and training; (2) life’s work; (3) materials and processes; (4) beliefs and values. At each station, students answer questions and/or complete tasks. For example, at the station “life’s work” students might plot the artist’s various installations on a map of the world. Encourage students to draw a parallels to their own lives and reflect on the countries/cities/communities that they have lived in and the significance of these location to them. Museum of Modern Arts Website: Valentine, The Fastest. From “The Sugar Children Series.” 1996. Gelatin-silver print. 20 x 16″. Courtesy Wooster Gardens, New York. • Artist Themes – Reflecting a Community Historical and Contemporary Concerns: Using the resources from above and others, engage students in an investigation into the following question: How have Muniz’s other projects reflected community? While reviewing images of Muniz’s work in locations throughout the world, introduce the three guiding questions: (1) How does Muniz collaborative artwork connect with First Nations communities in British Columbia and in throughout Canada? (2) How does Muniz’s collaborative artwork reflect a community’s current and historical concerns? and (3) What actions might collaborative, community inspired artwork inspire in others? Have students brainstorm possible preliminary answers to these questions. Teacher records these and posts them in a visible area of the classroom. Reconfirm that the purpose of this inquiry is to delve further into these questions and that answers and understandings are meant to evolve and change. • Muniz’s Collaborative Art & Hot Doc Waste Land – How can collaborative artwork reflect continuity and change in communities? This process connects to Muniz’s previous work creating large scale mosaics with people in different communities, most famously with garbage-pickers in the Brazilian junkyard Jardim Gramacho chronicled in the 2010 Oscar nominated film Waste Land. Teacher might lead with the following quote from the documentary: “One man’s garbage is another man’s treasure”. 1/ Students view the documentary Waste Land (the following Wasteland Guiding Questions Worksheet (PDF) might be helpful. 2/ Introduce/revisit the concept of Cause and Consequence. Post-Film Questions: How does Muniz’s project reflect continuity and change for the individuals and locations featured in his work? What are the causes and consequences of those changes? 3/ The landfill was closed 2012. These CNN; PBS links discuss the consequences of its closure: The Official Wasteland Site details what the catadores featured in the film are up to today. 4/ Culminating Questions: What changes did the catadores experience as a result of the publicity generated by the film? Do you think the garbage portraits project did them more damage or good to the catadores? • Artwork Themes: Recycling – How can collaborative artwork encourage us to reflect upon and think critically about the environment? How can Muniz’s work encourage us to reflect upon and think critically about recycling? 1/ Review of Muniz’s various art projects throughout the world. 2/ Encourage students to think about how Muniz’s art reflects “reducing, reusing & recycling”. 3/ Discuss Muniz’s reuse of materials in his collaborative works of art. For the installation in Squamish, Muniz used natural materials that spoke to the history of lumber and logging in the region. Wood chips, rocks and scraps of wood arranged by tone to create the image of the wolf. 4/ Teacher shows this short 19min clip Gone Tomorrow: The Hidden Life of Garbage: from Heather Rogers’ documentary or the book by the same author and use the following 8 Cooperative Recycling Experiments (PDF), to get students thinking critically about reducing, reusing & recycling. 5/ Follow-up questions: As a school community, as individuals and as families how can we reduce, reuse, recycle and pre-cycle? If you had to choose one or several natural or reusable item(s) to create a work of art what would your choice(s) be? 6/ Students come up with an idea for the creative reuse of materials. Inspire them with some real-world example, like First Nation’s artist Brian Jungen’s transformation of athletic shoes into Aboriginal masks or playgrounds and running tracks made of Recycled Shoes. See Idea 29 in 32 Innovations That Will Change Your Tomorrow. Students might develop prototypes and “pitches” for their own creative reuse ideas. Additional Resources: High school students might read a nonfiction text like Garbage Land: On the Secret Trail of Trash, an exploration of what happens to society’s discards by science writer Elizabeth Royte. • Artwork Themes: Recycling – How does collaborative artwork encourage us to reflect upon and think critically about the environment? How do governments and local businesses encourage citizens to recycle? 1/ Students form different teams based on their interest: for example: garbage vs. food scraps; e-waste; recycling (plastic, paper, metal); recycling (mattresses, drywall & wood, yard and other residential waste); landfill & transfer stations; and businesses. 3/ Potential culminating questions: How is your community encouraging its citizens to reduce, reuse and recycle? In your community does everyone sort their garbage and recycle? Why would someone not choose to? What are some other ways that government and businesses could further encourage their citizens to reduce, reuse and recycle? 4/ To get a better picture of what happens to their community’s waste, consider a facility tour of a landfill, community-recycling center, or waste energy facility. See the list of Metro Vancouver’s curriculum connected field experiences. What are some of the historical challenges that First Nations communities in BC experienced with regard to title and rights in the past and how are these challenges still present and being addressed today? 1/ Opening discussion: What rights do you and your family have in relation to your home and your subsistence (having adequate clean, safe water, food and shelter)? Where did these rights come from? Who protects these rights? Who will protect these rights in the future? This discussion is intended to reinforce that rights are secured in part through claims about what happened in the past: a rental agreement was signed, a property was bought and these carried forward into the future on the basis of trust between parties and the state which could enforce that trust. 2/ Teacher introduces/ revisits the concept of Continuity & Change. 3/ Reserve History: In small groups, students use this Aboriginal Rights and Title Timeline. an view this Reserve History Powerpoint to create a timeline of BC First Nations Title and Rights by collating photographs and text using a digital timeline generator like Capzles* or large sheets of paper. 5/ Groups answer to the following questions as a class: What does the story of your timeline show? How have First Nations title and rights in BC changed over time? Why do you think they have changed? 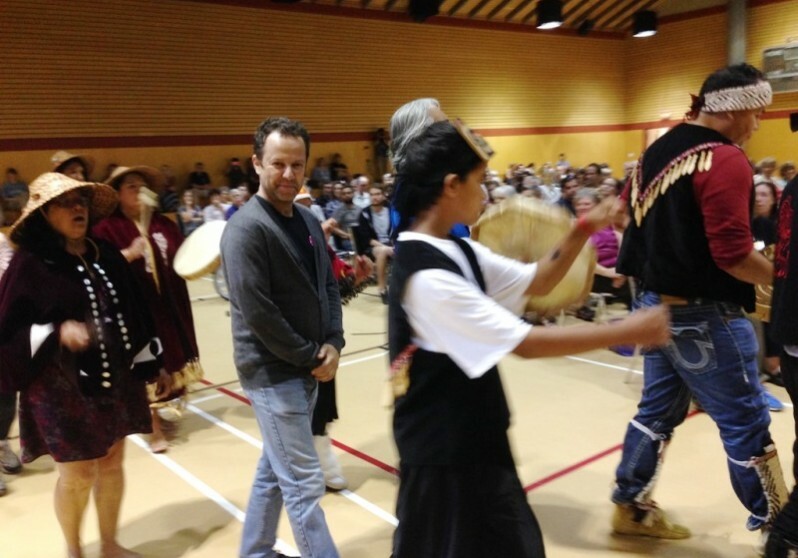 What has changed the most for First Nations title and rights in BC? What has changed the least? Are there times of more continuity or more change? How could your timeline be divided into chunks or periods? What events might be most important for First Nations women? What events might be most important for the Canadian government? 6/ After viewing all the timeline presentations the teacher can challenge the students to answer the question: Do you think in BC are getting better or worse for First Nations’ First Nations title and rights? Why? Students are asked to take into account economic change, social and cultural change, and environmental change. • E-waste —How are electronics that contain toxins discarded? 1/ Challenge the students to investigate what happens to their outdated mobile phones and other electronic castoffs. 2/ Call to the attention of students to different government policies that address this issue. As background reading to understand the practical challenges of e-waste recycling, students might read Responsible Recycling: My E-Waste Odyssey and compare the writer’s experience with their own e-waste sagas. 3/ After investigating the issue, students have the option of hosting an e-waste recycling program as an action project. To plan an event, they can consider the Electronic Waste Code of Ethics developed by the environmental educator Christopher Swain. They may also wish to look into how local businesses are dealing with e-waste. For example, see the Green Deal program initiated by London Drugs. From the ground, Muniz’s installation appears to be a mass collection of rocks and wood fragments. When viewed from an elevated platform, his work pushes the limits of photography and the image of a wolf emerges. He often draws from art history, pop culture, photojournalism or portraits of people. 1/ Have students research a work of art from an artist covered by the concepts and content of the Social Studies 6 or 11 curriculum . Students may use this artist’s work as inspiration in the creation of their own original artwork using recycled materials. 2/ Students take photographs of their work from ladders, playground equipment or the school roof. 3/ Teams develop their photos in an enlarged format by a local business like London Drugs. 4/ Students host an exhibition of their work for the community. • Teacher and students can reflect on their entire learning process by revisiting the Guiding Questions. • How did the unit of study open inquiry, create cross–curricular learning opportunities and/or apply learning to real life situations? Has this unit of inquiry changed your opinions, values and worldview? In what ways, if any, has it helped you grow as a learner? Remind the class that the image of the wolf, was chosen by the Squamish community as a symbol of collaboration and unity. Tell the class they are now going to engage in a collaborative writing experience using the wolf as main theme. Students are provided with the guidelines that character names should not be those of their peers and that violent or gruesome plots are not allowed. Teacher chooses an allotted amount of time for each portion of the story based on the student’s grade level/ writing ability. Each student writes the beginning of a story without putting their name down on the paper. At the end of the allotted time, the story gets passed to another student in a preset order. This student reads what was written and continues to develop the plot. At the end of the allotted time, the story again gets passed to another student to write the conclusion. At the end of this collaborative experience, the class will engage in an editing activity in small group to finalize the story and present the stories back to the entire class. • Science – How do North American wolves adapt and survive in their habitats? 1/ Teacher reviews the concept of climate change and how it affects habitats. Pose the question: What is habitat? What kind of habitat do grey wolves need? 2/ In small groups, using the websites below, students research the habitat and range of the grey wolf populations of North America. Discussion Questions: What food does the Grey Wolf usually eat? Why do Wolves hunt in packs? Why are packs so effective at getting their food? What are scavengers? What types of scavenger follow wolves when they hunt? ; How does a good supply of game to hunt indicate climate change? How do scavengers benefit from increased wolf kills? 3/ Students then research how the wolf is being introduced into areas where it has long been extinct. Discussion Questions: Is the program a success? Watch the video about wolves and its place in the ecosystem after they were re-introduced into the Yellowstone National Park. What are some of the problems that the naturalists have encountered while reintroducing the wolf into certain regions? What are some other options for helping North American wolf populations? 4/ Possible extension: Wolf Hunting season re-opened on August 1st in British Columbia. It is once again legal to hunt and kill wolves without a bag limit. Students could research why this legislation was re-introduced and what impact it has on the ecosystem, humans and the wolf population.